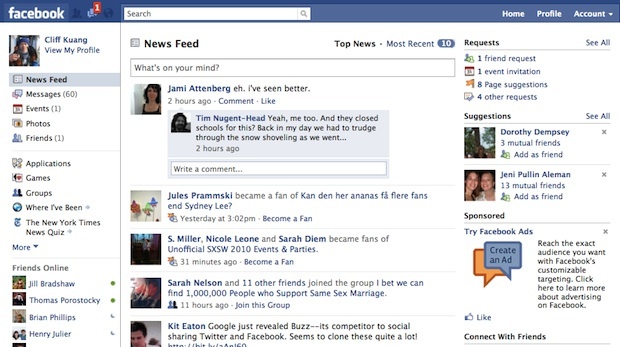 Test Driving Google Buzz: How Does Facebook Compare? Buzz has some great rich-media sharing capabilities. But Facebook still owns your social-sharing network. Yesterday, Google unveiled Buzz, a new service for sharing short updates that’s been immediately billed as direct competition for both Twitter and–more interestingly–Facebook. Today, Buzz has just begun trickling out into the real world. So how does the service stack up with Facebook? Here’s a quick review. 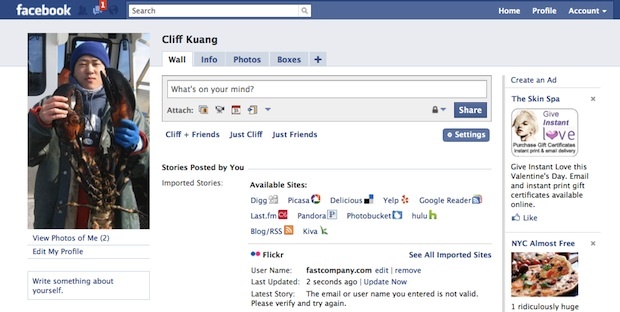 But really, how many people in your Facebook network link all those accounts to their wall? Facebook’s integration is fiddly, forcing you to look up things like public URL’s. I’m betting not many people in your network actually use that functionality, precisely because of the wonky integration process. Those sound like minor details, but the mere fact that you can get so much media inside of Buzz means that it’s much more believable as a central point from which you can track everything happening in your network. And that, really is what Buzz was after–it’s trying to insert itself at the center of your content sharing life. Facebook didn’t begin that way, and that genealogy shows itself pretty clearly when you start really testing its capabilities. Looking at the images above, you can see why: It’s hard to know where to look with all that yawning whitespace, links undifferentiated by importance or usefulness, and extraneous information. Notice how much information you see before having to scroll the window, and you get a sense of Buzz’s short comings. Buzz works only insofar as the people you follow actually use the service, and the services its linked to. Facebook works for an entirely different reason: Because all your friends are on it, and all of them are looking to Facebook as an explicitly personal social outlet for sharing pictures and snooping on each others’ lives. Buzz doesn’t have that advantage–and without personal profiles, what’s Buzz except a really good Twitter client? Sure, it’s great for sharing updates and images, but where do you actually want to share those? Through a dedicated, beefed up Twitter client like Buzz? Or through the network of friends you’ve already built up through Facebook–and which might not overlap too much with your e-mail address book? In that sense, Facebook and Buzz aren’t really in direct competition–that is, until Facebook unveils its mail service. When that happens, Buzz will certainly force Facebook to overhaul it’s integration with Youtube, Twitter, and everything else (a new Facebook-AIM tie-up might be the tip of the iceberg). Rich media capabilities versus the value of your social network: Let the battle begin.